For reasons of providing maximum satisfaction to our clients, we utilize the finest raw materials and modern machines, as per the set industry norms and guidelines, for manufacturing this range of Automatic Four Head Liquid Filling Machine. This ensures the product’s strength, capacity, performance, service life and precision. Further, the offered range is priced quite reasonably. 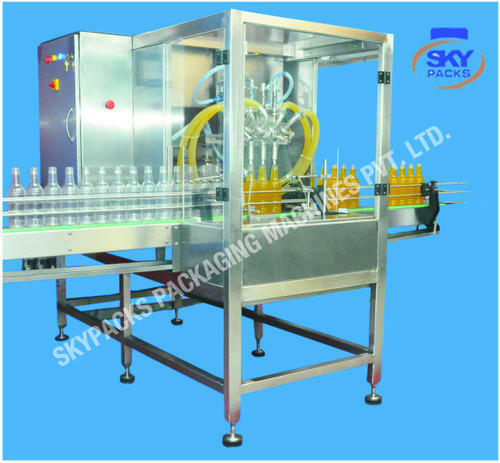 Skypacks Packaging Machines Private Limited, one of the leading manufacturers, distributors and suppliers of this commendable range of Filling Machines, began our operations in the year 2014. Making of this range is done as per the set industry norms and guidelines, utilizing the finest raw materials and modern machines. This ensures the products, performance, service lie, speed, capacity and strength. The offered range is made up of the finest Automatic Liquid Filling Machine, Automatic Pickle Filling Machine and Automatic Viscous Filling Machine, having a high demand in the market. Further, the range is marked at the most reasonable rate possible. Our highly developed infrastructural facility, equipped with all the necessary machinery and equipment, help us in the attainment of a number of the firms predefined goals and objectives. The facility regularly upgraded, help us in the maximization of our reach in the market. For reasons of managing the firms operations in the best possible manner, the facility has been parted into several highly operational units. These units, in the most effective manner, help us in the generation of greater productivity. In addition to this, our huge client base is owed to our highly ethical working habits.